The Washington City Paper discovered an Arlandria institution in this week's edition (Waffle Shop in Alexandria - Young & Hungry). 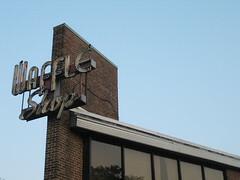 The Waffle Shop, which occupies a strange, triangular peninsula of cement, like Alexandria’s own tiny Flatiron Building, is one of the city’s few 24 hours a day/7 days a week operations. .... At all hours you can look through large picture windows and see a gritty, grease-spattered Edward Hopper scene: construction workers, bus drivers, and other folks sitting at the grungy, counter scarfing down food out of Styrofoam containers. The secret to the Waffle Shop’s success? Clarified butter. See their listing on yelp and add a review.